Quite simply the most desirable ukulele to hit our shelves in, well forever! 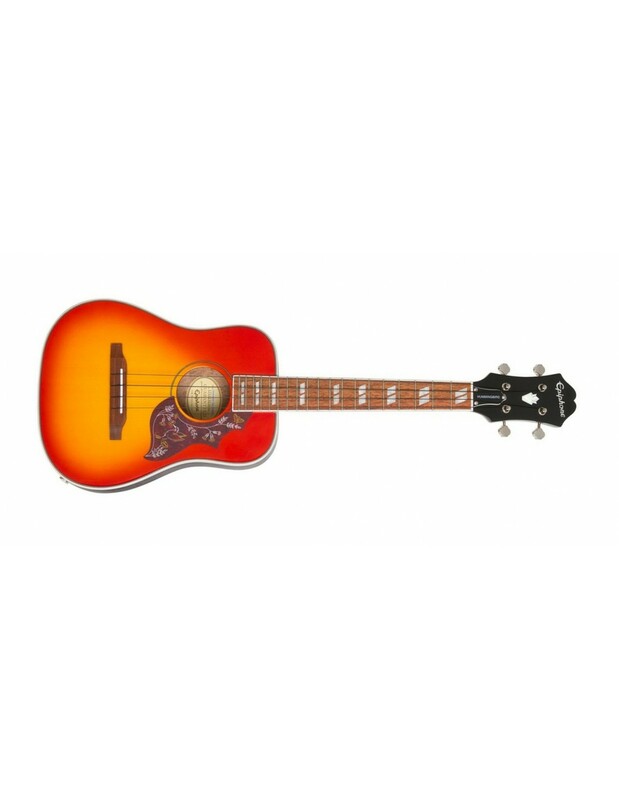 But as much as this diminutive take on the classic Hummingbird Dreadnought is a dream to see, it is an incredibly well-specified and sweet sounding uke in its own right. The solid spruce top, solid slim-taper neck, decent pickup and gigbag all contribute to a package that punches as well as it endears. The Epiphone Hummingbird Tenor electro acoustic ukulele is shaped to the classic Hummingbird profile, giving it a substantial feel in the hands as well as making it a solid performer. 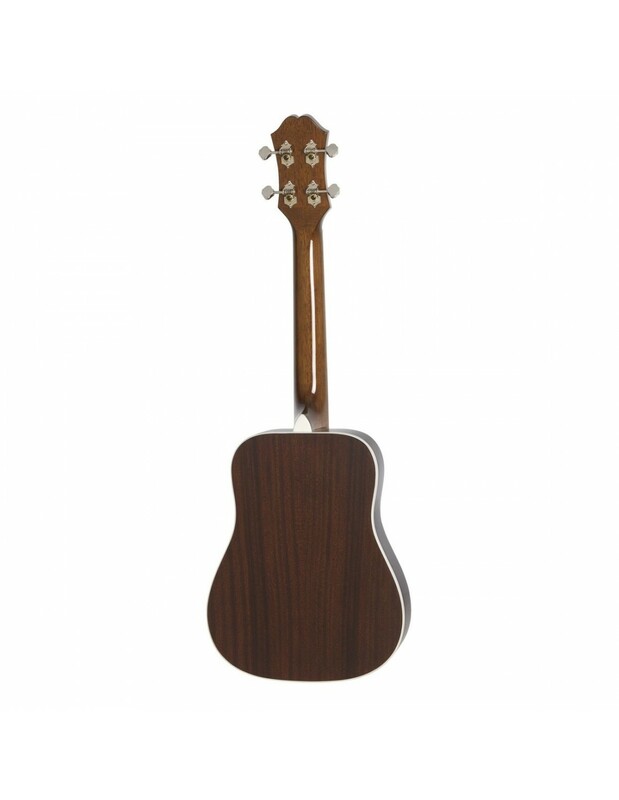 Built using mahogany for the back and sides, the ukulele produces a confident midrange energy that is projected gleefully by the solid Sitka spruce top. The tobacco sunburst finish is complemented beautifully by the imitation tortoise with iconic "Hummingbird" graphic. Joined to the body is a stable mahogany neck, which is shaped to a comfortable slimtaper C-profile along a generous 17-inch scale length. Paired with the neck is a luxurious granadillo fingerboard with 19 medium-sized frets to explore. Single-ply white binding runs along the edge of the neck, whilst parallelogram position inlays guide your way in style. The flat 12-inch radius allows your fingers to run along the fingerboard with ease. The Hummingbird Tenor is set to standard GCEA tuning at the factory with a high G.
The Epiphone Hummingbird Tenor is equipped with a Piezo film under-saddle pickup, which translates the acoustic timbre of the ukulele beautifully when you want to perform via amp or PA. Whether you're going solo or playing as part of an ensemble, the Hummingbird Tenor can comfortably hold its own in any performance. Fitted to the body is a reverse-belly granadillo bridge, which anchors each string securely to optimise intonation and sustain. The sloped dovewing headstock is adorned with a classic Epiphone logo and Pineapple inlay in pearloid. Premium open-back machine heads with 14:1 turning ratio uphold tuning integrity with precision.